Watch this space for news on the release of the latest work on Zero Postulation Results. 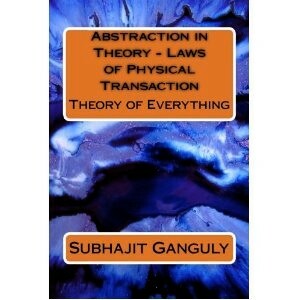 The title Abstraction in Theory: Zero Postulation Results: Theory of Everything (Book – 2) is to be released soon. This book is a way forward towards the “theory of everything” in physics.True to this gigantic task,the author approaches the subject in a completely new way.The whole theory is based on the concept of “zero-postulation”,an area where others have been less than successful. The idea of “zero-postulation” in itself is a tremendous leap in the methods applied in studying sciences.Based on no assumption,this approach is totally based on solid grounds,unlike the other theories in existence.It is a neat and satisfactory description of the world. ‘Over some years now, a large part of the energies of the scientific community has been employed solely for finding a theory that will fit in all known happenings of the physical world. Various groups of scientists have tried to attack the problem from different ends. Some of these theories have been partly successful in explaining the known physical world. However none of these theories have been without shortcomings. Be it the much lauded String Theory or the Quantum Gravity postulation or any other such attempts towards arriving at a Theory of Everything, none have been proved to be foolproof. Zero postulation and the principles of the Theory of Abstraction are used to study structures of energy inside a black hole, which is incredibly heavy and incredibly small. We chase the questions, how matter (with various structures) is formed from energy and the energy making up matter has to be in what orientation to form the matter that we see. 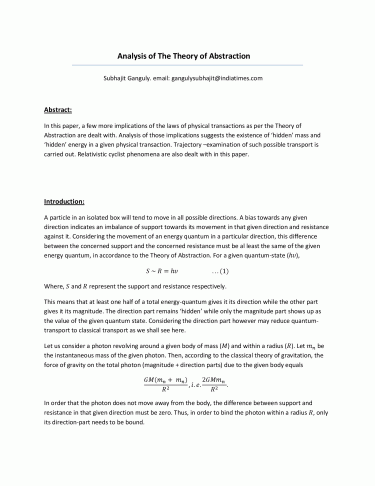 We arrive at the fundamental model and the equations describing the formation of structure in energy. The Abstraction theory is applied in landscaping. A collection of objects may be made to be vast or meager depending upon the scale of observations. This idea may be developed to unite the worlds of the great vastness of the universe and the minuteness of the sub-atomic realm. Keeping constant a scaling ratio for both worlds, these may actually be converted into two self-same representatives with respect to scaling. 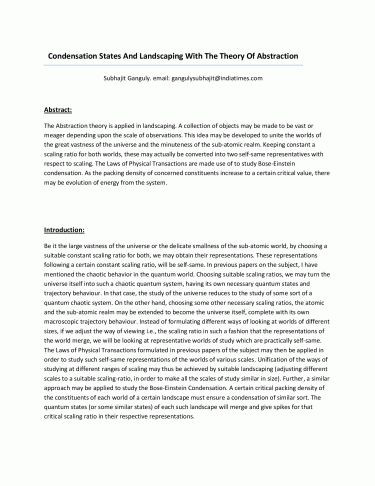 The Laws of Physical Transactions are made use of to study Bose-Einstein condensation. As the packing density of concerned constituents increase to a certain critical value, there may be evolution of energy from the system.